In the Lok Sabha, the notices for the no-confidence motion, moved for the first time since the nearly four-year rule of the BJP-led alliance, were not taken up as Speaker Sumitra Mahajan. New Delhi: The proceedings in Parliament were washed out for the second consecutive weeks today due to protests by opposition parties, which also led to the failure of the Lok Sabha to take up notices for no-confidence motion against the NDA government moved by parties from Andhra Pradesh. While the Lok Sabha proceedings were first adjourned till noon and then for the day, the Rajya Sabha was adjourned straight till 2.30 PM and later for the day with Chairman M Venkaiah Naidu expressing anguish over the proceedings being paralysed ever since Parliament resumed its budget session on March 5 after a recess. In the Lok Sabha, the notices for the no-confidence motion, moved for the first time since the nearly four-year rule of the BJP-led alliance, were not taken up as Speaker Sumitra Mahajan, who said there was no order in the House and adjourned the proceedings for the day amid vociferous protests over various issues. The notices were moved by the YSR Congress and the TDP, who have been demanding special status for Andhra Pradesh, an issue on which the latter today quit the ruling alliance. The no-confidence notices were moved by YSR Congress member Y V Subba Reddy and TDP's Thota Narasimham. 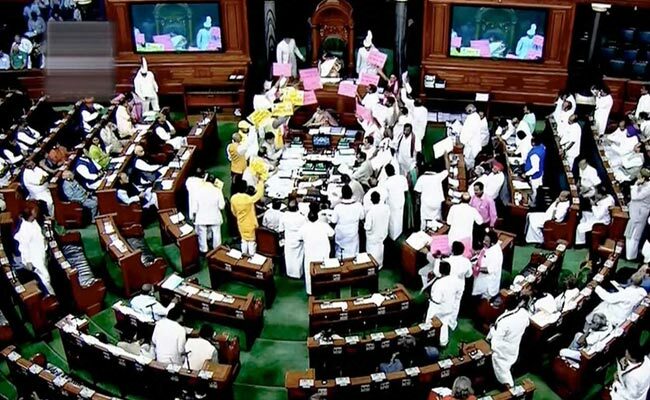 The Lok Sabha proceedings were washed out for the 10th consecutive day following incessant protests and sloganeering by various parties, including TDP, YSR Congress, AIADMK and RJD over multiple issues, including special status for Andhra Pradesh and banking scam. Congress members were also seen standing at their seats. Soon after papers and reports were laid during the Zero Hour, Ms Mahajan said she has received a notice for no-confidence motion. "I am duty-bound to bring it... provided the House is in order," she said amid the din. "I request all of you to go back to your seats," Ms Mahajan told the members protesting in the Well. However as the members continued with the protests, the Speaker said since the House is not in order, she was unable to take up the notice and then adjourned the proceedings for the day. 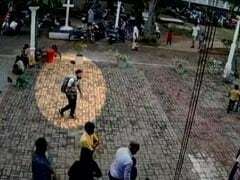 Members from TRS and AIADMK were in the Well holding placards and shouting slogans. Minister of State for Parliamentary Affairs Arjun Ram Meghwal made a statement regarding the government business to be taken up in the House next week. Soon after the House assembled at 11 AM and was to take up the Question Hour, the proceedings were adjourned till noon due to the noisy scenes. Earlier, three newly elected MPs, RJD's Sarfaraz Alam (Araria-Bihar) and SP members Nagendra Pratap Singh Patel (Phulpur-UP) and Praveen Kumar Nishad (Gorakhpur-UP) took oath. Since Parliament reconvened on March 5 after Budget Session recess, the Lok Sabha and the Rajya Sabha have been witnessing disruptions on a daily basis. On Wednesday amid chaos, the Lower House had passed the Finance Bill and appropriation bills without any discussion. The Rajya Sabha proceedings were abruptly adjourned soon after it met, following a brief argument between the Chairman and some Congress members. After tabling of the listed papers, Mr Naidu expressed anguish saying the House has not functioned ever since it resumed on March 5 after recess during the Budget session. Before adjourning the House till 2.30 PM, the Chairman said there were larger issues like banking scam, Cauvery river water sharing, demand for a special package to Andhra Pradesh and sealing in the national capital, which were agitating the minds of people and needed to be discussed. He said notices given by members on these issues were accepted and he has agreed for a discussion on them but yet the House was not taking up the debates. Mr Naidu hoped that the House would function normally from next week and have constructive proceedings. "I am very much pained that the Upper House of Parliament is not able to transact its business for last two weeks. Dont't test my patience...We are meeting, greeting and not doing anything and adjourning," he said. He said that "we have to go by consensus or by the majority of the House on deciding the issues. You can't dictate something and say whether you go my way or the highway. That is no way, I must tell you," he said, adding that the Chair would not allow such a thing. Mr Naidu also warned the protesting members to ensure smooth functioning of the House before "I take extreme views". As he was making the appeal, Congress member Satyabrat Chaturvedi stood up and said he agreed with the Chair, but sought to know whether it was for the first time that he is witnessing such a scenario in Parliament. To this, Mr Naidu asked if somebody committed a mistake in the past, does it mean that he should also do the same. "Do you want this sort of a thing to continue? ... Is that your suggestion. Is this your party view?" As some other Congress members were on their feet trying to join the issue simultaneously, Mr Naidu adjourned the House till 2.30 PM. When the House reassembled, Deputy Chairman P J Kurien asked TDP MP Y S Chowdary to complete his speech which he was making yesterday when the House was adjourned. Mr Chowdary said the earlier government had given several assurances to Andhra Pradesh about being compensated after Telangana was carved out of it. However, the state "lost" cosmopolitan city of Hyderabad and the revenue arising from various industries and has remained only an agrarian state only, but has not been compensated, he said. The bill to bifurcate the state would not have been passed if the assurances was not accepted by the members of the House, he said, amid protests by members from the Congress benches. As soon as he ended his speech, protests by some opposition members led the Deputy Chairman to adjourn the House for the day.